The updated compact crossover Chevrolet Trax (Chevrolet Tracker) model year 2016-2017 officially debut at the Chicago Auto Show. Model Trucks Chevrolet (Chevrolet Tracker) in the process of restyling received updates in the style soplatformennogo SUV Opel Mokka X and potential buyers will appreciate the new body more stylish design, significantly improved interior with higher quality finishing materials, expanded list of modern equipment. Sales of the updated Chevrolet Trax will start in the autumn of 2016, 73 countries around the world at the price of 22,000 dollars. In Russia, Chevrolet Tracker in 2016-2017 a new body, the purchase is not officially work, but to get acquainted with a novelty on the photo and look into the interior, to assess the level of complete sets of equipment, learn specifications can and should be. Changes in the design of the exterior body of the updated Chevrolet Trucker purely cosmetic in nature, but the SUV got a new front of the body with modern narrowed headlamps (in the maximum configuration Premier with LED arcs of daytime running lights), more powerful and expressive two-tier grille, located on a massive bumper. 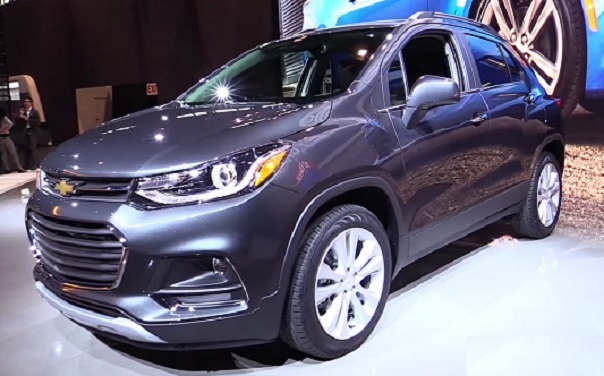 New Chevrolet Trax shows a family resemblance to the Chevrolet models in the design of the front part of the body, cost just look at the new generation of Chevrolet Cobalt, Chevrolet Cruze, Chevrolet Cruze Hatchback and Chevrolet Malibu. Feed renewed American SUV unlike dorestaylingovoy model acquired mutated marker lamps and the new bumper with larger segments of the fog lamps. The road version of the content of Premier LEDs with original graphics. 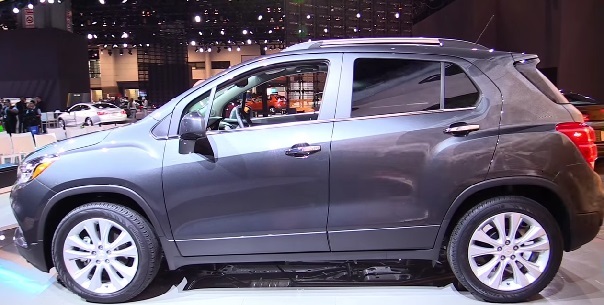 External dimensions of the body of the new Chevrolet Trax (Chevrolet Tracker) 2016-2017 year have not changed in comparison with the pre-reform and SUV up 4248 mm in length, 1792 mm (2035 mm in view mirrors) in width, 1674 mm in height, with 2555 mm wheelbase base and 168 mm ground clearance (clearance). The compact crossover equipped with standard tires 205 / 70R16 in the 16-inch wheels, as an option offers 18-inch wheels with tires 215 / 55R18. Unlike cosmetic changes in the external design of the interior of the Chevrolet Trax redesigned new is very important. Salon updated model of the American compact crossover sports a completely new front panel and center console, a new more informative instrument panel and an upgraded multimedia system MyLink color touch 7-inch screen (Apple CarPlay and Android Auto, 4G LTE with Wi-Fi access point) higher-quality finishing materials. Equipping basic configuration LS is quite extensive, in the presence of front and side airbags, ABS with EBD, ESC and TCS, HSA, factory alarm and central locking with remote control, air conditioning, audio system with 6 speakers (CD-MP3, Radio, USB, AUX, Bluetooth), power mirrors and windows. The options include rear-view camera, and 10 airbags, as well as modern security system — Side Blind Zone Alert, Rear Cross Traffic Alert, Forward Collision Alert and Lane Departure Warning, touch screen multimedia system, cruise control, parking sensors, power lumbar adjustment it stops the driver’s seat, combined (fabric and leather) or full leather seat trim, heated door mirrors and front seats. The luggage compartment of the American SUV is able to take depending on the position of the seat backs of the second row from the minimum 356 liters to a maximum of 1370 liters of volume. Under the hood, the crossover can be installed one of two petrol four-cylinder engines. and 1.8-liter naturally aspirated engine (140 hp 178 Nm). A choice of two transmissions 5 and 6 speed manual automatic transmission Hydra-Matic. Standard SUV comes with front-wheel drive (FWD), as an option, a system plug-AWD all-wheel drive. The front suspension is independent with struts McPherson, rear semi-dependent on the beam torsion. The brakes on all wheels disc, ventilated front discs with a diameter of 300 mm, rear 268 mm normal. Test — drive the Chevrolet Trax 2017.